Download Cap'n Magneto NOW and start playing today! QuickTime slide show of the original ShareWare ads! 4/11/06 Donut Life?? What's THAT??? A child's toy? A religious artifact? A scientific instrument? Cap'n Magneto doesn't know! Maybe you should SEE FOR YOURSELF! 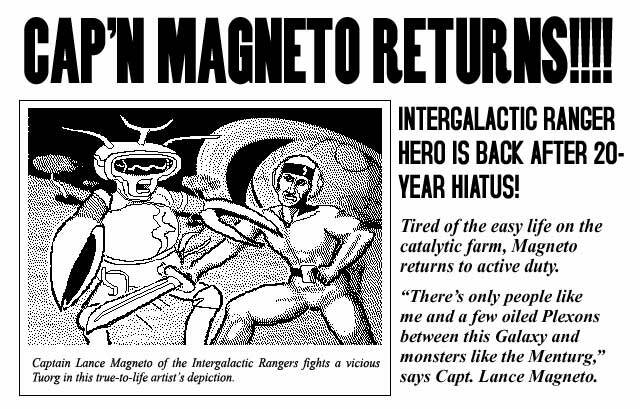 3/20/05 Cap'n Magneto for MacOS X! Version 2.1 of Cap'n Magneto has been Carbonized, and now runs natively under MacOS X! It also offers a couple of new features -- "accelerated" time and a "live" Tricorder. Of course, your registration code is still valid. Get the new version HERE! 2/23/05 Whee! Longtime Mac journalist Peter Cohen has covered the re-release of Cap'n Magneto for Macworld/MacCentral. Here's a link to the story. IGR HEADQUARTERS -- Cap'n Magneto was enjoyed by thousands of players all over the world when it was released in 1985 for the original Macintosh. Twenty years later, Cap'n Magneto is back, and a new generation is enjoying this classic adventure! In 1990, MacUser magazine called Cap'n Magneto one of the 200 best Macintosh products. It was one of the first games distributed worldwide over the internet. Cap'n Magneto had a completely different feel from the adventure games of the time. To quote a contemporary review by Robert Eckhardt: "There is no syntax to learn, since everything you want to do, you simply do, period." How do you cross the dorc bridge? Where is your spacesuit and how can you get to it? Where can you get the fuel to fly? How do you get an engine part guarded by your own reflection? What does it mean when a friend tells you, "Blank is magic"? These are puzzles you'll solve to repair the hidden space ship and blast off from Rigel IV. Cap'n Magneto is not a game where every creature you meet is your enemy. Some are likely to be friendly, some are not. Some are brave, some are not. Some are more reliable than others. Any of them may decide he likes or dislikes you. Your enemies will attack you, but your friends will give you valuable clues and help you fight. Many of them have special abilities and tendencies, that you'll learn to love -- or hate, in some cases. Cap'n Magneto takes place in GameWorld. GameWorld is a complete environment with its own laws of physics which are peculiar, but reliable. All of the creatures you meet have their own characteristics, as species and as individuals. Cap'n Magneto has been called the "forerunner of the graphic adventure game", but Cap'n Magneto is more than the "first of its genre". The unique algorithms used by GameWorld to determine what happens next assure that Cap'n Magneto's adventure is coherent, but never predictable. You'll play it again even after you win, because the next game will be different!